Making a fantasy MMOG is a bit of an uphill battle these days. No matter what you do, if you're making a Western-style MMOG it'll be invariably compared to reigning champion World of Warcraft. 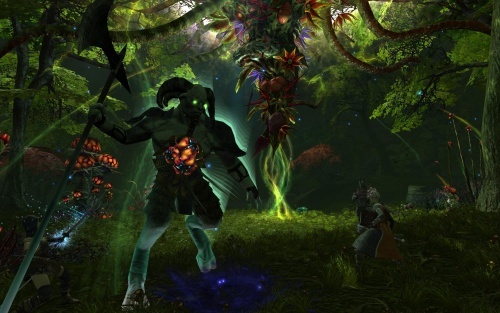 If it's an Eastern-style MMOG, it'll be compared to Lineage II and/or Aion. Still, said Design Director Simon Ffinch at Trion's preview event for Rift: Planes of Telara - formerly known as the infinitely more generic Heroes of Telara - familiarity isn't a bad thing. If a player logs into the game for a first time to find two potential factions (one noble and one more vicious) and the four archetypal class types of wizard/fighter/rogue/healer, it means that they're going to understand the game right off the bat. You draw them in with familiarity, said Ffinch, and then you make it interesting. There is quite a lot that feels familiar out of the gate in Rift. The world of Telara feels very typically "fantastic," and new players will find that it controls and plays just like the MMOGs they might be used to - exclamation marks indicating questgivers and all. The catch, of course, is that Telara is a nexus of sorts: No less than six different planes of existence converge on Telara, and the intersection of these planes with the "real world" drives the story. Of course, the idea of other planes entering a hub world is nothing new in an MMOG, but what is interesting - what Simon Ffinch and the rest are using as their hook - is exactly how the planes and Telara interact. Rifts to the various planes will "dynamically" spawn around the world, and when triggered will unleash changes on the environment around them. Of the six existing planes at the moment, we were told of only two, the planes of Death and Life (and how much do you want to bet that the other four are Fire/Water/Air/Earth, hmm? ), and of those two we only saw the Plane of Life in action. When the rift was triggered to the Plane of Life, it spawned a massive floral monster that rapidly turned the entire surrounding area into something lush and teeming with life: plants sprouted from the ground, and everything became quite a bit more overgrown than it had before. When a rift is activated, we saw, it started an event similar to the Public Quests in Warhammer Online - anyone could contribute to sealing the rifts back up again, and if you contribute you will get loot when all is said and done. The problem with WAR's Public Quests was that they were fixed and unchanging - the dynamic nature of Rift's rift emergence should keep things fresh, said Ffinch.